Where’s the college course about getting a job? Home » Where’s the college course about getting a job? In the August 22, 2017 Ask The Headhunter Newsletter, a reader who works in a college says students need more than academic education. They deserve career education. Colleges need to do more to teach students how to negotiate, how to dress for success, and other life skills. I currently work at a community college. To say that the majority of the student body is under-served is putting it mildly. They need a lot of help, much more than we can provide, but we are there to try to help them succeed. A few years ago, one of the student workers at the library was selected (her name was randomly drawn) to keep the clothes and accessories the Student Success Center and a women’s organization purchased for her as part of a dress-for-success workshop. She also got to have her hair done, and learned how to do her makeup. She was so thrilled and grateful, because she couldn’t afford to go to Kohl’s and spend $350.00 on a few new (professional) outfits for herself. The problem is that for some jobs (I’m thinking business, not nursing) you have to look like a million bucks even if you can’t afford a designer suit, shoes, and handbag just for the interview. She was 30 and admitted that she didn’t know what was appropriate for interviews and even where to begin. The workshop taught her about interviews, including how to dress for them, and she found the class helpful, as do most of our students. Do you think part of the purpose of every college is to give people the skills to get better jobs? I think that includes more than academic knowledge and technical skills. Where’s the college course about how to get a job? New grads are generally very unprepared for the challenge of getting a job. While colleges vie for position in magazines that rank them on the salaries of new graduates, the same schools deliver woefully inadequate career education. I’m a big believer in education for its own sake. Nothing we learn is ever wasted. The main purpose of a college education is not to get you a job. But I’ve come to believe that there’s no excuse for any college not to prepare every student and graduate for employment. College just costs too much for most students not to be able to recoup their (or their parents’) investment in education. Colleges have an obligation to address their graduates’ need to work. The program you’ve described is a great example of how a school adds an important benefit to education. But it also highlights the fact that this young woman essentially won a lottery, because it’s clear not all students at your school get the important benefits she won. The bigger issue, of course, is why all schools don’t deliver the necessary preparation to all their students. My proposal to colleges and universities is this: Dedicate one class meeting in every course a student takes to how the subject matter relates to a profession, a career, and a job. (See Colleges fail How.) Bring in guest speakers to discuss and explore how a course topic applies to their work — or to tell how it has influenced their jobs or careers and how it has contributed to their success. Sure, many such presentations could be a stretch. How does a course in early American literature play out for a salesperson? How does a financial manager benefit from a course in cognitive psychology? The challenge to make these connections is the point. The purpose is to help students see the myriad and often unusual ways a college education contributes to success at work. The ensuing dialogue would give students an enormous head start in understanding the world of work and jobs. There’s another benefit from such guest presentations that I’m shocked colleges have not figured out already — and that students and their parents have not demanded. If colleges incorporated my suggestion into their curricula, at the end of four years a student who takes the roughly 40 courses to earn 120 semester credits necessary for a degree will have met around 40 people who do 40 different jobs in 40 companies in an enormous number of industries. It’s of course up to the student to ask these guests questions, to get to know them, to stay in touch with some — and to form mentoring relationships with at least a few. Would this be such a difficult undertaking for any college? I’ve heard professors argue it’s not their job to relate a course to the world of work, and that they just don’t have the class time to waste on such curriculum content. Being prepared for work and being well-educated go hand in hand. What are your ideas for colleges to better prepare students for jobs? What incentives (or pressure) would encourage schools to deliver career education that pays off for everyone? If you’re an educator, do you think my suggestion of an extra class meeting is nuts? If you’re an employer, what level of readiness for work do you see in new grads? What are your suggestions for colleges? This is a great topic and you hit it on the head when you said college graduates are woefully unprepared for the job market. Hypothetically, if someone were to create a quality curriculum taught as 1 class per semester over 2 years in community college and 8 classes in 4-year institutions, they could change the world! I can see no downside. The schools would benefit because they could gauge how good they are by the full-time employment rates of their graduating classes. It may increase enrollment, increase community interaction with the school, and perhaps, stimulate corporate gifts over time. The students benefit in obvious ways. @John: What a concept, eh? In the early nineties I worked for a University (in Holland) for a few years. At an open house I overheard a manager of one department stating to prospect students and parents that his department was not one they would have much dealing with throughout their time at the uni. It wasn’t until they finished their education and had gone out into the world that would understand their education didn’t exactly line up with real work life. That’s where his department helps, as students can come back and be re-educated to be better prepared for that crazy world out there. When I asked why that wasn’t integrated into normal education and thus save students having to come back he just gave me a confused look. Management at that uni also firmly believed that the most important people there were staff and teachers. Students were just something you had to deal with. Trying to debate otherwise was a road to nowhere. I will be teaching a Senior Design course this fall, and I am planning a few lectures to talk to them about career planning. I will also point them to your blog which is a valuable career resource for first time job seekers and seasoned 30 year veterans alike…. This is a great topic and I love your ideas. My university had a “career center” that was laughably terrible. Materials were woefully outdated and the “career counselors” gave “advice” that was outdated and often not relevant. I don’t place the full blame on them though. Every student is also assigned an advisor, who is supposed to help them reach their academic goals and prepare them for graduation. I had very little interaction with my “advisor”. Barely asked any questions about what I wanted to do after college. Universities should take a close look at how they are currently handling the advisor position and career centers. Ideally, we could improve these resources AND include a guest speakers during the classes. Yeah, this is the main reason I’d be nervous about Nick’s idea; not that it’s a bad one, but because college career centers are just terrible more often than not, and I’m not sure professors (many of which have spent their entire careers in the academy, which is well known for having very weird hiring and employment practices compared to the “real world”) are well-qualified to connect their theory and research with actual jobs and careers, or find people who can. TBH I think we need to rethink this whole college thing from the ground up. Nick’s idea could really help a lot of people in the meantime, but it’s a bandaid on a stab wound, you know? @Amy: Here’s my confession, and the reason I’ve been beating this dead horse for decades. During my senior year in college I found this hidden place called the career center. I visited once or twice, found it all overwhelming, and never went back. The leaflets I took with me were useless — about resumes, interview questions, how to dress. Where were the jobs? How did having a college degree help me find work? What was all this about??? There are some good career center folks out there. They know who they are. But in general it’s a travesty because college administrators believe jobs are not their responsibility. Except a 4-year degree is often a prerequisite. Even if the degree has nothing to do with the position. @Gregory: Now you’re opening a new can of worms — the role of employers. They want the degree, but they’re disappointed when degreed applicants show up without any understanding of work. So now where do we point the finger? While it is true that curricula at liberal arts schools are not designed to “help you get a job”, it is interesting that colleges are marketed and priced based on the fascinating and lucrative careers they’re not preparing you for. It really bugs me that post-secondary education does its best to avoid market forces by focusing the sales pitch on those who will not be bearing the costs or will be bearing those costs in the unimaginably distant future. Would you buy a car from a salesman whose response to “How much does it cost?” begins with “There are lots of scholarships and grants available…”? Isn’t that essentially what “financing” is? Internships are a way to transition from academia to life. My career blossomed as a result of the internship. My college guidance counselor insisted I investigate the internships available and she was right on! My internship turned into a career that brought me wealth and created a family. Personal opinion . . . start from nothing and earn your way to the top. Ameritocity is alive and well. @Paul: You got lucky with that counselor. And you were lucky to get an internship. I agree that internships are a great way to learn job skills, but unfortunately, not all internships are created equal. In my previous job, many of the prospective applicants wanted to use their internship experience in lieu of professional work experience in the field but the majority of them lacked internship experience that was even remotely equivalent to professional work experience in the field. Instead of getting hands-on experience, they were answering phones, walking their bosses’ dogs, picking up their bosses’ dry cleaning, shopping for birthday and anniversary gifts for their bosses’ wives and children, booking their bosses’ vacations, picking up their bosses’ kids from school and babysitting them, etc. So I think it really depends upon the kind of “internship” students get–too many get taken advantage of and used for other things the boss needs to have done (such as taking on the tasks of the receptionist while said receptionist was out for maternity leave, on vacation, etc.) but that teach them little to nothing about the field. Others got good experience, but it never reached the minimum amount required to be eligible to apply for the master’s program. Nor do internships guarantee students jobs with the company or agency when they graduate. An acquaintance’s son did three summer internships related to his major, chemistry, yet when he was graduating, despite working hard and getting glowing references from the companies at which he interned for free, none would hire him because chemistry majors are a dime a dozen and the companies were choosing to hire people with Ph.Ds and master’s degrees in chemistry. A bachelor’s degree was not enough. Many internships do not pay, which creates challenges for poor and working class students, who have to earn money over the summer to help pay for their college expenses. Those fortunate enough to have parents who can underwrite their living expenses for the summer AND pick up the extra costs for their kids’ college incurred while their kids worked without pay over the summer. It can get expensive–rent, utilities, food, transportation, phone, incidentals, plus a more professional wardrobe means that those from more modest backgrounds opt not to do internships that don’t pay and thus can miss out on making the connections that are so important when it comes to job hunting later. I’ve long thought that more preparation for living should start in high school prior to college. I think practical every day math should be taught, like how banking works, how to handle a checking account, how credit works, mortgages, etc. Not everyone continues their education but everyone can benefit from more basic information. Not everyone has good parenting or parents who even understand personal finance. Since the healthcare coverage in the US is such a mess and not likely to be fairly remedied any time soon, why not teach about that as well? Might encourage kids on the fence to continue their education. Yes, I know, the nanny state. But if schools are to prepare decent citizens for challenges ahead, why not? Not “nanny state.” Schools used to have Shop and Home Economics. When I was in school, everybody took both. These helped prepare the kids for “life after mom & dad.” They also taught civics. The biggest “why not?” is because the school year is so stuffed that things like PE, art, music, recess, and lunch are being curtailed (not just because of budget cuts). There are many organizations for young people that help with this. My personal experience is with Boy Scouts and 4H. There are many other fine groups. Some churches in my area have programs that include coaching for job seekers. Civic/service organizations can also take the lead with this. @Gregory: My local high school gutted the shop and home ec classrooms to install a fancy cooking lab. They explained that no one needs shop or home ec any more. I do give them credit for listening to one math teacher who wanted to teach financial literacy. Cries about “the nanny state” are ludicrous in this context. Why not just shut down all schools and let kids figure it out on their own? The problem is lack of structure and objectives in schools. As Karen suggests above, this has to start even before college. Students need to be taught to think about jobs and work from Kindergarten. I agree with you, Karen. It should begin at home, but what happens when your parents’ jobs don’t match your interests? They can’t introduce you to the “right people” because they lack those connections themselves. 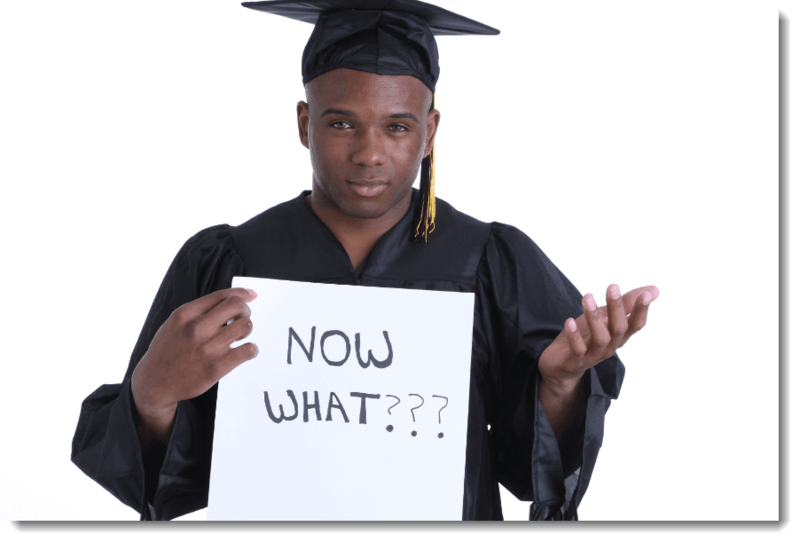 First generation college students often have bigger challenges than those students whose parents graduated from college because first generation students don’t know what they don’t know, don’t think to ask, and for some, get plenty of push-back from home. If you don’t have a good guidance counselor in high school and you’re the first in your family to try to go to college, much less have a different kind of job/career, it can be really difficult. I think that too many college career services centers don’t do enough for students, but they’re often understaffed, under-trained, and under-funded by the university. At my previous job, the career services center was only for undergraduates, and even then, faculty and staff in my dept./school knew that all csc would do is review students’ résumés. When graduate students began asking for job tips and career services questions, I couldn’t even refer them to the “experts” because csc would refuse to help graduate students. Sometimes the faculty would help, but more often they wouldn’t. Some had good reason–between applying for grants, overseeing research with grants they won, sitting on various committees, hearing students’ oral defenses, researching, publishing, teaching, etc., they had little time for advising students about academic matters, let alone helping them with their résumés and sussing out jobs for them. The best faculty for that task would have been the adjuncts, many of whom worked full time in the field and taught part time/periodically, but they didn’t have offices, office hours, support staff, and couldn’t meet with students during the day while they were at work. Additionally, the university often limited the amount of and kinds of non-teaching duties for adjuncts. They couldn’t or weren’t supposed to serve on committees (hiring, theses and dissertations), advise students, or serve as graduate program directors and dept. chairs (administrative positions). But many did bring their professional work experiences into the classroom and students probably got a better idea of what kinds of jobs there were and the types of career trajectories others had than they got from the regular (non-adjunct) faculty. I worked in the recruitment industry for a decade. Now I work in a campus career centre. I wish that we could be in the classroom! While some schools to offer a for-credit career readiness course, most do not. Unfortunately, many students will not take advantage of the career services that are available to them (usually for free), unless there is a grade attached to it. The students who do, see higher post-graduation success (in terms of job placement). A handful of faculty are gracious to allow us 5 minutes in their classes. Other faculty offer bonus marks to students if they attend a career workshops and/or event. Why not make it a required class? Many (most) universities have some core, requisite courses; everybody has to take them. Place an “Intro to Job Search” for the freshman year. And a “Job Search in the Real World” for the senior year. @Gregory: I’d love to hear from professors. Would they support such required courses? 1. Some schools offer one career readiness course. 2. Schools teach students to focus only on courses that give grades. 3. Faculty have to be convinced to allow you 5 minutes to present on careers. I agree! This is something we struggle with at my current job. I work at a community college, so the students are commuters, sometimes from great distances but even those who live in the same city may face long commutes home and to work (public transportation presents some big challenges). Many are older students who don’t have time–they’re here for classes and then they go to work or home to take care of children and/or elderly parents. I’d love to see career planning a required course but I can’t even convince TPTB to make new student orientation required. The students chafe at required courses in which they have no interest, and the “new thing” being considered is to have fewer required courses. The student in the automotive tech program doesn’t want to bother with the required math and English courses because he hated them in high school and doesn’t see the point in requiring them in college. Then employers complain that young people lack basic reading, reading comprehension, writing, and math skills…. Unfortunately, most academics have never applied for a job outside the world of academia (and the application and hiring process there is vastly different than the process in the corporate world). Most are unqualified to teach students how to be successful in the job hunting process. The reluctance you note comes from a place of insecurity not job description of time management. The reason why I became an avid reader of your site was that you correctly point out the flaws in the hiring process that cause employers to miss out on great candidates. So I am surprised to see a column where you take their side and repeat the excuse they use about blaming the colleges for why they can’t find qualified employees. The one thing I noticed the university departments outside of colleges of business don’t do is create a direct pipeline between their students and the companies they want to hire those students, but it is completely wrong to say that students graduate not knowing how to look for a job or find one. In my graduate school major, we learned marketable skills, as well as how to market them, but we were left to our own devices as to finding jobs to apply to. I know that I was prepared to do a job because nearly all of my classmates found good jobs, and some even found jobs in other cities besides the one where the school is located, or the city they were from. On top of the education I received that I know prepared me for a job because my classmates got hired, I completed an internship with the one government agency that even people who say they don’t like government still respect. And a search on Linkedin proved that likewise, the people I interned with got jobs after graduation. So the disconnect is with the employers. Why, when I apply to jobs with the same degree that’s gotten other people hired, and the same internship that’s gotten other people hired, am I getting passed over for even an INTERVIEW. I HAVE A MASTER’S DEGREE THAT’S GOTTEN OTHER PEOPLE HIRED AND I CAN’T EVEN GET AN INTERVIEW!!!! That’s not the school’s fault, that’s the fault of someone who isn’t doing their job when reviewing resumes. I HAVE EVEN BEEN PASSED OVER FOR INTERVIEWS WHEN I NETWORKED MY WAY INTO THE ORGANIZATION TO WHICH I WAS APPLYING!!! That is the not the fault of the university. I marvel at the fact that anyone ever gets hired, especially when no matter how you find out about a job you still have to go through the HR gatekeepers, who normally have no clue about what the job you are applying for entails. All they do is keep you from talking to the one person you really want to talk to, the hiring manager, because that’s the person who you can actually talk shop with. @Robert: I think the answer is in your last paragraph. I’m not sure it’s the employers OR the school in your case. HR, or whatever system a company relies on to hire people, isn’t working. While I’m pointing a finger at schools in this columns, I don’t give employers a pass. They’ve learned to do “just in time hiring.” They want candidates who’ve done the exact job for 5 years already — at a lower salary. They’ve got no interest in learning curves, training or on-boarding. There’s plenty of blame to go around for the condition of the job market. I agree with you: Schools and employers need to start talking with one another. You need industry associations to step up and sponsor that kind of endeavor. My experience is that professors are in contact with professionals in and out of academia in their chosen fields. This makes for great PR for the industry the college and good for the students especially if there are scholarships or paid internships. I developed & directed a program for a number of years that gave out thousands of dollars in college scholarships mentored students on employment issues and led to good employment. When I worked..it was in the Computer industry, R&D side, so my examples will refer to that world, EE’s CS degrees, MEs and such. In my 2nd life I was an IT recruiter than an inhouse recruiter where the vocations were varied. Throughout, I interviewed with a lot of grads and grads-to-be & as such indirectly was exposed to the output of many universities, most of which were perceived (at least by themselves) as top of the line. Except for on-site college job fairs, I rarely met grad candidates who didn’t dress well or inappropriately. The job fairs seemed to be the opposite, where commonly you ran across students who were unpresentable & ill prepared. Over the years (going back to the 70’s here when I became a manager) what I saw is well expressed in the main topic. And this isn’t a whimsical observation, I asked about any training/coursework related to job hunting. Most students had no clue as to a next step. Their most honest answer was “I don’t really know” about what to do with their degree & what they had to offer and where to offer it. The assumption was the hiring company would tell them…the what. So a lot of my interview time was a short course of “what”. But I think the short-fall in universities is deeper than that. There was no understanding of context…How can a computer company use a EE or a CS grad? And where does that fit into the products or services they make money from. And where best would a grad add value to the revenue stream and most likely enjoy doing so? Armed with context, where’s a good place to start, and start doing what? A CS grad could cut code, but had no idea that code wasn’t a sellable product…that there was something called a software development life cycle starting with an idea and ending up with a tested, documented, marketed, useable product, that in itself was still not an end product but a sub system that needed integration with hardware and firmware to satisfy a customer’s need. The tendency for the grad and the university was to just generally equate a CS grad to being a programmer, ignoring the fact that a CS grad was not limited to programming, but could engage in multiple other vocations that they would very much enjoy doing, if they knew they existed, and which we very much needed people with their technical understanding. Never found a university that gave them those insights, they were just tossed into the pool. The universities give lip service to job assistance via the counselors..but that’s hit or miss. There are some great knowledgeable advisers who give great direction, network into industry, keep current. And there are some who don’t. Much better would be coursework devoted to and focused on nothing but career development and job hunting training, including the art and craft of networking basics. And it should be mandatory. These skills would well serve their students their whole lives and build a great foundation to get started. Whereas much of the subject matter in their majors, age out if not reinforced constantly by experience for further education. I ran across one university who did have such a course. I found out about it when the professor (who I think was the idea’s champion) reached out into the business community for manager volunteers to conduct on-company site interviews. Role playing to some extent on both sides as while they were about real jobs students were interested in, they were not with my company or our area of interest. But they got experience in the whole interview process. Schedule a time, dress up, find our venue, be on time, etc. After which I’d offer a real-time post-interview critique (which they don’t get in the real world), and send a report back to their instructor. It may not sound like a biggie, but it was much better than role playing at the university, and very encouraging to find a university that was doing it. I have been asked to speak to students per Nick’s suggestion that universities invite hiring managers in to speak…but only once. Someone mentioned internships. Internships hit dead on in offering real life relevant training, & I and peers have done many. But internships also are hit & miss, full of intern horror stories from both sides, students with no preparation from their university and/or looking for a summer paycheck and hiring managers who just use them as warm body go-fers wasting student time & the company’s reputation . I gave interns real work, including high school (seniors) interns. But…I’ve never heard from a university before or after for assessments about the students…or more important to assess us as intern employers before we engage with their students. Nor after to get our assessments. In one company we employed CS professors during the summer for win/win scenarios. They kept their feet in the real world, positioning them to give experience based instruction to students on how their degree could be applied, how it’s really done, and in so doing, give us avenues to students who would be good interns and new hires. I ran across a university where the students, coached by a Subject Matter Expert adviser set up their own organization with a structure that reached out to industry, set up their own mini-job fairs at corporate venues, set up by invitation on-campus networking events, from which they developed corporate contacts and vs versa. Very well run and well done. So it’s not all grim, but nevertheless, academia historically gives a low priority to what should be and could be their best value add…preparing students to make a living. The capstone course of the program was business strategy. What they should have done was had executives from local business and industry come in and talk to the class about business strategy. Sadly, no. A textbook by an author who obviously never worked in the business world. You’re not the only person who’s noticed this. Shocking, but not really. Years ago, law students didn’t learn how to practice law–law school was pure theory except for a first-year moot court course. Students graduated from law school, passed the bar exam, and when they started their first jobs, they didn’t know how to draft a motion, how to write a will, how to write a contract, or even where to sit when they went to court. The expectation was that the employers would teach you these things. So newly minted attorneys had little value to employers outside of knowing a great deal of legal theory but not having a clue how it worked in real life (in practice). Medical school is much different, much more hands-on. The first two years of medical school (undergraduate medical education) is solely book learning. The last two years are the hands-on clinical rotations so students get a few months experience in all of the fields (surgery, pediatrics, ob-gyn, psychiatry, etc.) which is to help them decide the area in which they wish to specialize and thus do their residencies. Residences last anywhere from 4-7 years, for which they are paid (not a great deal, but they’re still earning money) and they hone their skills. Some will do internships afterwards but others opt to go into practice. Perhaps we need to look to the field of medicine re how to structure “job skills”. Wow, that’s shocking. My MBA program was all about creating value for a company. How to define value, how to build companies from the ground up. Even how to prepare for a career. Downside to having this knowledge is that I sometimes have to tell people above me that the thing they want to spend money on has no value to the company. But that’s another story. A few words got edited out by this site – apologies! Thank you for your straight-talking response to the inquirer. I had what I considered a good college education, which prepared me to become a teacher. I haven’t been a teacher in decades, and much of what I learned about the world of work didn’t come from my college education! Many of us already do this. I am chair of accounting and finance at the Saunders College of Business, Rochester Institute of Technology. We require ALL students to go through a career preparation course. We spend a great deal of effort trying to help our students develop job skills. Students should investigate what schools on this before choosing one to attend. Hi Bill – are those career courses at the undergraduate or graduate level? Thanks! @Bill: Thanks for posting — that’s great advice to students considering a school. Investigate its career-prep program. And if Saunders delivers career prep education, kudos to you! I’m sure other schools do, too — but we don’t often hear about them. One example I know about is the Olin School in Massachusetts — its engineering grads are all set for jobs thanks to a rigorous career-prep program. Another is Stevens Institute of Technology in NJ. I tutor students at a community college. So many students come to college unprepared for college-level work and they have not developed basic life skills such as time management and study skills. My time with them includes tutoring in the subject matter and mentoring. I think students are required to take courses that have nothing to do with their field of study. These fluff courses need to be eliminated in favor of something that will better prepare students for the work world. However, universities are sclerotic and unwilling to change, unless the environment forces them to do so. Universities should provide a strong foundation in skills and knowledge needed to succeed in the work place for a student’s field of study. Employers need to understand that universities cannot teach everything a college graduate needs to know for their particular business and employers need to be willing to spend time training new hires. Even seasoned people need training and time to get up to speed in a new company. I like the idea of internships but there are not enough slots to fill the need. I don’t know what the answer is but there needs to be shift in how education is delivered and what is taught. I think some of the free online courses supplement what is taught in the classroom and I’ve encouraged my students to use them. Thank you for resurfacing this important topic. Until we can teach these skills in the classroom, students will continue to focus only on what is measured. They’re taught to believe that the degree is enough, and while it might expand their opportunities, that’s not helpful if students are unaware of how to access those jobs or how to present themselves in an interview. For what an education costs, it’s pretty sad graduates leave ill-equipped to conduct an effective job search. It is time for a paradigm shift in this area. They’re not just taught that — the idea is heavily marketed to them by academic institutions. As if employers collect the degree at the door like a concert ticket and let you in the door for the show! We do indeed need a paradigm shift. Perhaps the ever-increasing, unaffordable cost of education will lead to that shift. Hello Nick – as a community college teacher I’ve developed a course that I (and sytudents) have had great success with,a course that I believe every man, woman and child in America needs (why am I being so modest?). It’s a 20 hour course that supercharges basic skills by 2-5 years, no matter what else is being taught. Emphasized are reading, writing, listening, speaking, information organization, critical thinking and study-skills. Additionally, the 3 skills associated with success in every field: how to start of time, stay on task and complete assignments. Perhaps you will not be surprised to learn that these skills are virtually totally ignored in virtually ALL schools -no matter grade level. To gain some insight into how I teach these skills in so few hours you may be interested in the 5-minute audio recording: https://docs.google.com/document/d/1YiF0Bajw2gawCVLjeLE0HPC7k350x4y1LLlSlvILbFI/. Thanks. One of the things colleges need to do a better job of is stressing that networking is about making personal connections, THEN finding opportunities through those connections. Nine and a half times out of ten when there is a ‘networking event’ involving college students, it features students (usually the wanna-be valedictorians) giving frantic monologues about what a genius they are to anyone too polite to excuse themselves. Yes, I have been in the industry 25 years, yes I know exactly what knowledge and traits we are looking for in the next generation of leaders. But, the student never heard about any of that because they filibustered me for 20 minutes about how innovative and insightful they think the paper they wrote for their 300 level class was. Too bad nobody actually working in the field cares about that topic. Make the personal connection first. What interests do we share? What interesting experiences have you had? What makes you an interesting and unique as a person? What do I like to do for fun? What passions do we share? Make that personal connection first and I’ll remember you when a job opportunity comes up, because I like you, and can imagine putting up with you 8-10 hours per day. The only way your personal soliloquy will be remembered is when my team laughs about you at the bar afterward. I still have no idea what he expected of me, or what anyone at these “live” versions of LinkedIn profiles expects. Unless we have a relationship and unless I can personally vouch for you, why would I refer you to someone I trust who trusts me? I wish you could check out Tech After Five in Greenville, SC. Started by a tech guy that hates social events, it is a great opportunity for people to talk about stuff and make contacts, as well as a safe place for people to practice their social skills. Oh, and Phil buys your first beer. “How does a financial manager benefit from a course in cognitive psychology?” Human decision making, problem solving, and biases are core topics in cognitive psychology. A lot of what is taught in the currently fashionable discipline of behavioral economics is based on cog psy research. I had a lot of business students who really got into those topics when I taught cog psy because they thought understanding how other people think would help them be better negotiators. They were right. @Carl: I used the cog sci example as an inside joke. Many readers know I have a graduate degree in cognitive psychology. And I use what I learned in my work all the time. :-) When I do presentations, I often discuss the connections. Thanks for standing up for the discipline! I worked for a guy who advocated taking every course possible that dealt with “how people think and act.” Psychology, sociology, etc. @Gregory: To those no longer in college, I recommend Bill Poundstone’s excellent book “Priceless,” a great, very readable survey of some important work in behavioral economics. I would think that anyone in sales or financial services would benefit from taking psychology classes–convincing someone to buy things, needed or not, will be smoother if the salesman understands a little psychology! *I believed the same as everyone else about job finding until I had a long night guarding a Starbucks display where I read almost the entirety of AtH. *I discovered a new career, went to the second year of the 2-year degree program and did three internships, whereas most people did one. I got my first job before I graduated, and had three real job offers within a couple of months, all through networking. It has been the most interesting and lucrative career of six distinct careers that I have had. Please visit their site. They offer suggestions and plans on how to get pertinent education without necessarily going through the regular college schedule, and how to get the most out of college when you do go – with an emphasis on taking a gap year right after high school to work on real-world projects and learn if that is what you really want to do. Nick, I would suggest you visit their site and write a review as a follow-up to this blog entry. @Michael: Send me the essay! Why do I think you shared your night guard story with me before? I love it! Better yet – lets take this farther. How about tying tuition/loans to whether or not graduates find meaningful work in their chosen fields at decent wages? I think you’d quickly find that college career centers would quickly change overnight and actually help students and alumni. Does anyone know Calvin, or other programs like this? I forgot to mention one of the best examples of team play between a university & one of companies I worked for. We built a lab next door the university and stocked it with the latest hardware and software systems under development and released equipment. We devoted a full time lab director and a couple of engineer team leaders to the lab. Engineer wanna be’s starting from Freshman year could intern there as well as work in the summer. Defacto they were now inside, positioned to live on the leading edge of the computer technology with related contacts to the main HQ R&D organizations. This worked out well and later was moved on campus for ultimate convenience of interning. The lab director would work to gain projects for the lab and keep the pipeline full. If there was a downside from the viewpoint of an engineering student, it was primarily a test lab. Many wanted broader experiences and chose to not return to one company every year, or when the mastered testing wanted to move mainstream. But all in all it was win/win scenario. @Doug caught the problem beautifully, most academics can’t help you prepare for most careers because the academic path gives them no experience in this. I went to a local large University and asked the Chair of a Biology Department If they were interested in setting up a career seminar series to talk about jobs and prep. I was turned away..” Not interested at this time” Really, I think the 175 graduate students all headed for industry are interested. True to form, I just found a Department that was interested. Physics had a Professor who has worked in the real world and she welcomed me in and we got it rolling. Universities are NOT job training centers. Yes, you do need a college degree for most upper middle class jobs, but you have to get off the internet and go meet with professionals to learn the ropes of professional behavior. While you are networking and learning, ask the people how they got to where they are and what they would have done differently. We don’t expect you to have this figured out at 22, so forget the Zuckerburg story and the Hollywood Business tycoon stories and talk to real people about their journeys. I launched out of an Ivy League doctorate into a recession, blundered into a job in Sales, fell in love, and am still doing it 30 years later. I’m stupider than most of my customers, but not my competitors, who still try to hire people who know why manhole covers are round.